Amyuni Technologies is pleased to announce that its PDF Converter has obtained the Windows 7 Logo Certification. End-users and developers can benefit from this certification by working with a printer driver that is not only up-to-date, but also features more security and performance. What is a Microsoft Logo Certification? Verifying that the printer driver does not crash the operating system even under heavy stress. Verifying that the printer driver can run multiple print jobs at the same time. Verifying that the printer driver does not take up too many system resources (i.e., memory, GDI handles, etc). Verifying that the printer driver is compatible with the new features of the Windows 7 operating system. Verifying that the printer driver performs equally well under a 32- and 64-bit Windows 7 operating system. If the printer driver successfully completes all of the tests, the Amyuni digital signature is applied to it and it becomes Microsoft-certified. A digital signature acknowledges more than the passage of rigorous software testing. Similar to a “time stamp”, a digital signature confirms the authenticity of a printer driver and indicates that it has not been altered since its testing by its creator(s), third-parties, or by malicious intent (viruses). Developing with the Amyuni PDF Converter is more than innovating with the latest Windows 7 technologies. Once it is embedded into a third-party product, developers can submit their application under the scrutiny of a Microsoft testing environment and (if it passes) receive its own Windows 7 certification. Such testing for a third-party product augments its Windows operating system compliance, compatibility, and credibility. Developers who already own a PDF Converter printer driver license can also take advantage of Amyuni’s custom branding option. Custom branding replaces Amyuni Technologies’ proprietary details from the printer driver’s Printing Preferences with those of the developer or vendor. Custom branding extends third-party product recognition and increases company visibility. Learn more about our branding and certification features at: www.amyuni.com. Unlike the workflows that previously surrounded printed content, today’s workflows contain more changing variables, especially when it comes to documentation. Documents are created, repurposed, archived, retrieved, and even merged into others. In short – they encompass change. As a result, keeping an eye on change is an essential part of document management. What is Metadata and Why Use it? Metadata is descriptive information about data. It can be embedded into a PDF file (as XML) to help identify its contents or characteristics during its travels. Examples of metadata include: author names, document title, subject description, source type, etc. Large amounts of unstructured metadata. For example, documents that are appended or merged with others acquire additional metadata along the way. Different frameworks to address the problem of unstructured metadata. However, such frameworks hamper the efficiency of dissimilar systems to interchange or process information. In and of itself, metadata is often used to address (short-term) document life cycles, especially within localized environments. However, if the volume and exchange of documents increases, so does the complexity of the corresponding metadata. Is there an alternative way to handle such document assets more effectively? This is where XMP attempts to position itself as a viable option. What is XMP Metadata and Why Use it? Introduced by Adobe in 2001, the Extensible Metadata Platform (XMP) is a labeling specification, based on the W3C Resource Description Framework (RDF). XMP provides a (cross-platform) format for creating, processing, and interchanging metadata. Therefore XMP (metadata) is a type of metadata that adheres to specific standards that dictate how data is organized and accessed. XMP metadata can be embedded into PDF documents, HTML, SVG, XML files, and image formats such as JPEG, TIFF, PNG, GIF, etc. Designed as a type of encapsulating framework, XMP can act as a bridge between different systems that need to exchange and use metadata. When it comes to documentation, embedding XMP metadata into PDFs improves their searchability and integration into existing work flows. In addition, long-term archiving standards such as PDF/A-1a and PDF/A-1b require the use of XMP to identify that their contents are PDF/A compliant. Documents become smart assets when they are accompanied with XMP metadata. 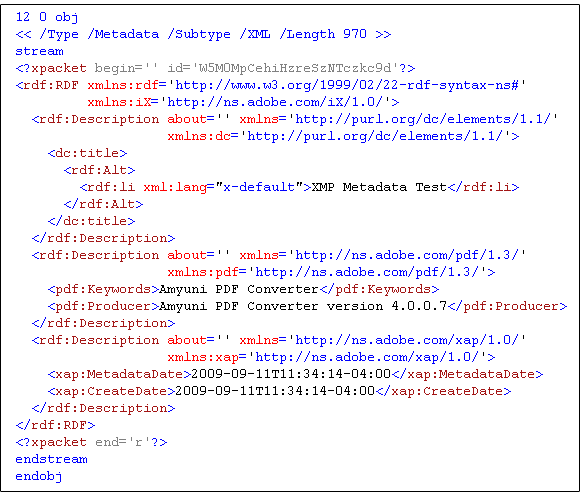 Once data is embedded in a PDF file as an XML packet (Figure 1) it stays with the file so it can be recycled and repurposed across different platforms or content-management systems. Because embedding XMP metadata differs slightly for portable document formats, developers should already be familiar with the XMP framework specifications and also how to work with the right XMP-enabled tools. An example of a such a tool is the Amyuni PDF Creator. Unlike other XMP-enabled tools which can only include standard XMP metadata, the Amyuni PDF Creator enables developers to include their own customized XMP schemas. This ability gives developers and document managers more authoring, tracking, and archiving options. In part 2 of this article, we shall look at how a product like the Amyuni PDF Analyzer can be automated on a server to embed custom XMP schema extensions into PDF/A documents. More than a decade ago Chuck Weger coined the term “preflight” to define the verification process of digital files prior to printing. Since then, this process or “check list” has materialized into integrated PDF options, plug-ins, and standalone products. One such standalone product is the Amyuni PDF Analyzer. Its purpose: to verify the internal validity and conformance of PDF documents. 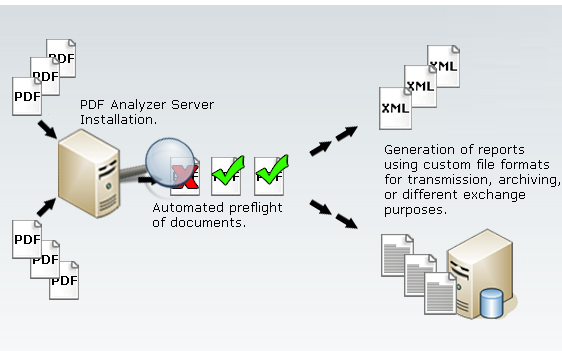 Unlike integrated options and plug-ins, PDF Analyzer can be installed on a server to perform the preflight of large numbers of documents as an automated batch process (Figure 1) without user interaction. PDF Analyzer validates the structure of PDF documents with customizable VB.NET rule sets (Figure 2) to ensure that the structure of documents comply with industry or custom specifications. 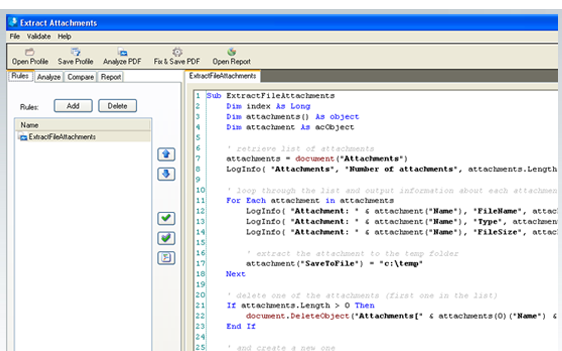 PDF document object instructions, syntax, and hierarchies do not contain errors. Fonts and corresponding font information such as TrueType tables are properly embedded. Embedded graphics and images are properly compressed for specific application processing. PDF/A documents contain embedded fonts, XMP metadata, and device-independent colors, etc. In addition to document analysis, you can also use PDF Analyzer to compare documents, verify sensitive metadata, and extract confidential information. Its design and functions stem from years of “on the field” application deployment experiences. Learn more about PDF Analyzer at www.pdfanalyzer.com.